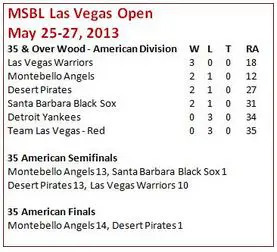 LAS VEGAS, May 27, 2013 — Cisco Vega doubled, singled and and has six RBI, and pitcher Mario Chavarin tossed a complete game as the Montebello Angels soared to a 14-1 win over the and a 35 Wood Bat American crown at the 13th annual MSBL Las Vegas Open. It was Montebello’s first title at the open. They lost in the semi’s in 2011, and lost in the finals there in 2010. Chavarin and Vega shared tournament MVP honors. Frank Esparzadoubled twice and added an RBI single on the day for the Angels. Mammy Pimentel’s solo home run in the seventh inning accounted for the Pirates’ only run and o ne of its three hits. Jason Farmer, who had four tournament homers, doubled and John Urratia singled to round out the Pirate offense. Vegas knocked a three-run double in the third inning to give the Angels a 5-0 lead. He added a three-run single in the eight-run eighth inning. Both the Pirates and the Angels finished 2-1 in round robin play. The Las Vegas Warriors were the only undefeated team in the division. The Angels knocked off the Santa Barbara Black Sox 13-1 to punch their ticket to the finals. The Pirates beat the unbeaten Warriors 13-10 in the semi’s. Angel’s Coach Robert Oskin praised his team’s strong offense which averaged 12 runs per game.and solid pitching.